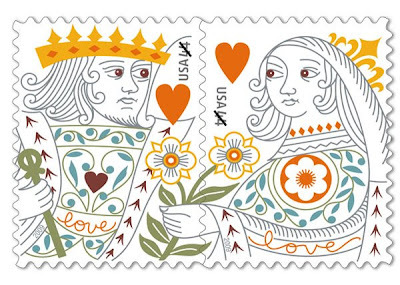 The Postal Service pays clever tribute to what is said by many to be world’s favorite “game” with the issuance of the King and Queen of Hearts, the latest stamps in the Love series. The two stamp designs, one of the King and one of the Queen, are based on images from 18th-century French playing cards. Stamp artist Jeanne Greco of New York City created the art on her computer. Greco and art director Derry Noyes of Washington, DC, settled on a design flowing through the stamp perforations to make a continuous pattern. 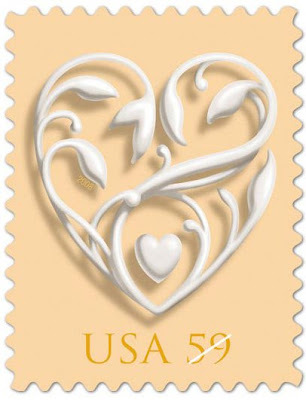 The Postal Service began issuing its popular Love stamps in 1973. Over the years these stamps have featured a wide variety of designs, including heart motifs, colorful flowers, and the word “LOVE” itself. "DIY" Free Stamp inspired printable notecards & address label here. 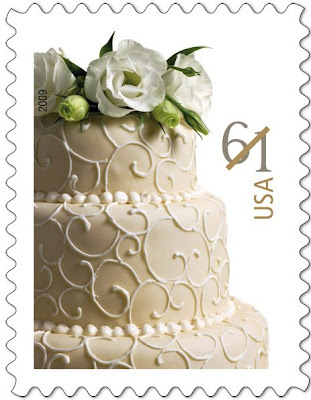 Sure to add a touch of beauty and romance to wedding correspondence, the 2009 Wedding Cake stamp will be issued at the two-ounce mailing rate to accommodate the heavier weight of an invitation, as well as other mailings such as oversize cards or small gifts that require extra postage. The stamp, designed by Ethel Kessler, features a photograph of a wedding cake taken by Renée Comet of Washington, DC. The photograph depicts a three-tier wedding cake topped with white flowers, their green stems and leaves a delightful contrast to the cake’s creamy white frosting. 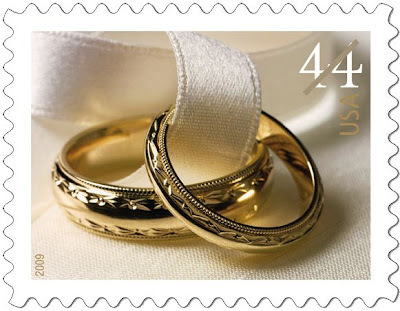 A new one-ounce stamp featuring wedding rings is intended for use on the RSVP envelope often enclosed with a wedding invitation. The stamp features a photograph of two gold wedding rings resting on a small white pillow; a slender ribbon of white silk unites them. The photograph also was taken by Renée Comet.